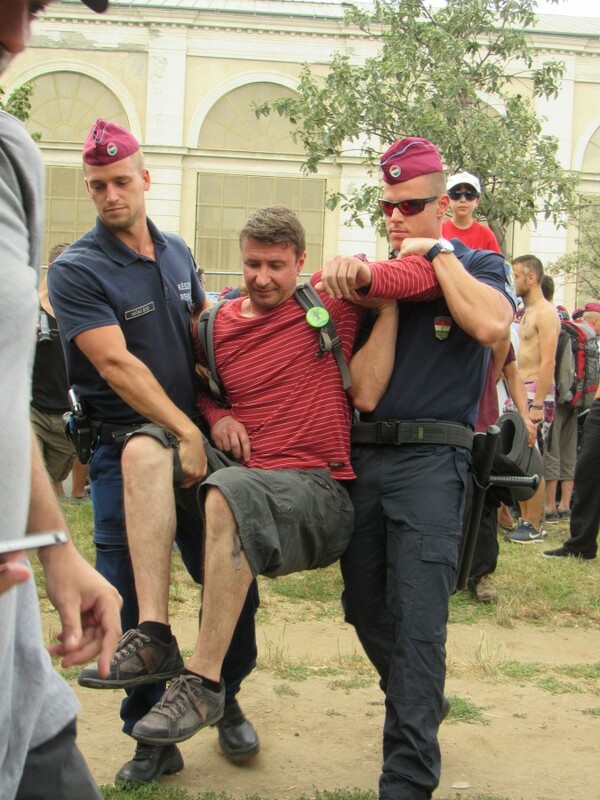 In other news from the European Union, not related to Brexit…Many thanks to my friend, Balázs Szücs, a city councillor in Budapest’s 7th District, for taking me to an eye-opening example of civil disobedience in Budapest’s City Park (Városliget) on Tuesday. Pro-democracy opposition activists and civil liberties demonstrators occupied the Hungarian Technical and Transportation Museum, chaining themselves to the windows, climbing up the roof and encircled the building, to protest the government’s plans to dramatically re-shape the City Park and presumably cut down dozens of trees, without sharing the final version of these plans with the public. Police carry away a pro-democracy demonstrator. Photo: C. Adam. A pro-democracy demonstrator chains herself to the museum. Photo: C. Adam. A protester chained to the museum. Photo: C. Adam. 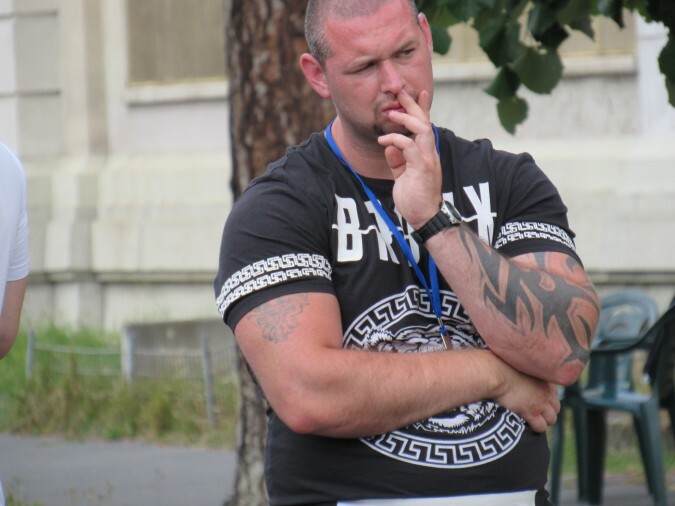 The company that manages the City Park and its controversial redevelopment (Városliget Zrt), had its security guards on site–the state’s security guards are the heavily tattooed burly men, dressed in black, that you see in my pictures. When the officers of the Budapest police arrived, they awkwardly took their instruction from these men. I asked the security guards why their names were not printed on their name-tag, and along with others, asked them to reveal their names to us. They said that their name badges were in their backpacks, which were all “stolen.” So the precise identity of the Hungarian company’s third-party security officers remains a mystery. “Why aren’t you at work, you dirty Gypsy?”–yelled the heavily tattooed thug hired by Városliget Zrt. A number of the police officers seemed visibly uncomfortable with this situation, especially the singularly soft-spoken police captain. But they had a job to do, and apparently part of that job involved taking instruction from, and consulting with nameless thugs, who are effectively employed by the state. 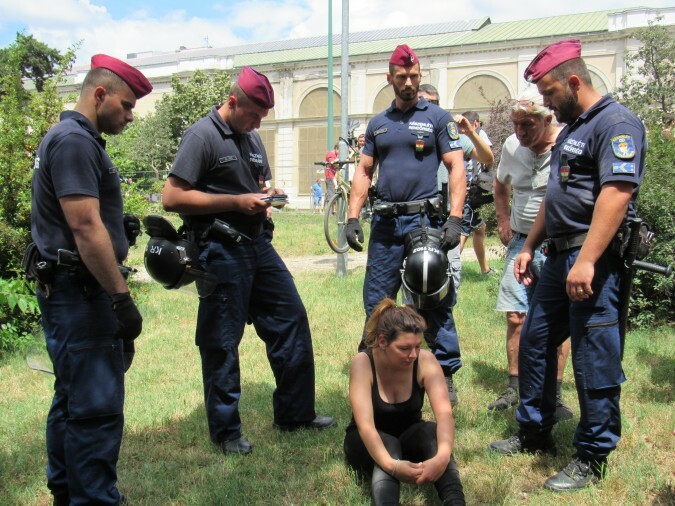 These security guards were almost certainly the same men who in the spring physically blocked the entrance to the Hungarian Electoral Commission in Budapest, in order to prevent opposition politicians from submitting a petition. Hungarian civil servants watched and did nothing inside the building, as unknown, burly men, dressed all in black, determined who was allowed to enter, and who could not, this government ministry. All in all, there were approximately a hundred demonstrators, most of whom were not affiliated with any party, but were environmentalists and/or pro-democracy activists. Gergő Komáromy. Photo: C. Adam. 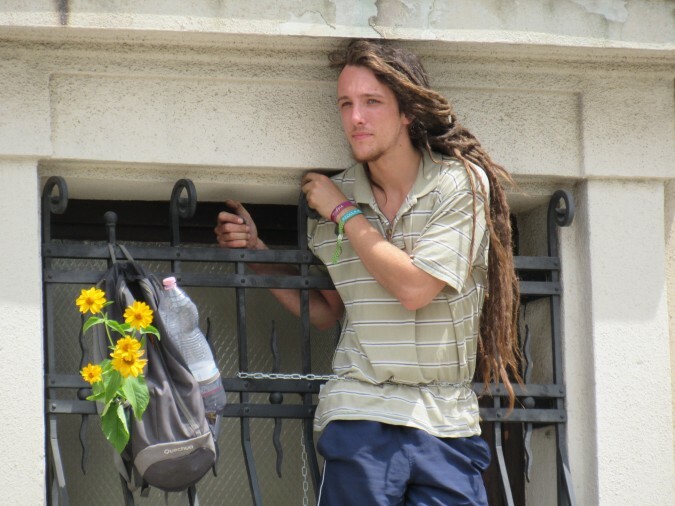 Gergő Komáromy, the activist at the centre of the demonstration, who managed to climb the roof of the museum, was forcibly taken by police, against his will, to the psychiatric ward of the Nyírő Gyula hospital. He had no choice, but to stay overnight, even though he told police and paramedics numerous times that he was fine, and had no need for psychiatric help. 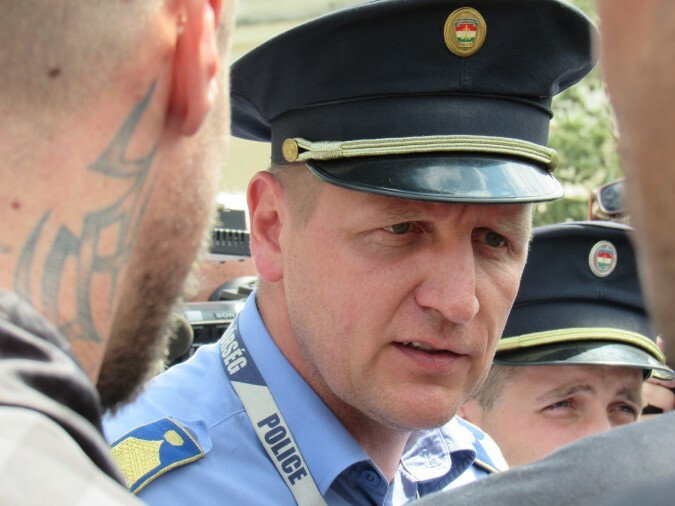 The police disagreed, arguing that Mr. Komáromy may have suffered sunstroke and might be suicidal. Mr. Komáromy added that after keeping him in the ward for nearly 24 hours, the doctors agreed to release him, noting that there was nothing wrong with his mental health. The young activist plans to lodge a formal complaint against the police decision to take him to psychiatric ward. What happened in Budapest on Tuesday is a textbook example of fascism: groups of private, nameless thugs and de facto militias, who physically intimidate and spew racist insults, are mysteriously engaged by the Hungarian state. 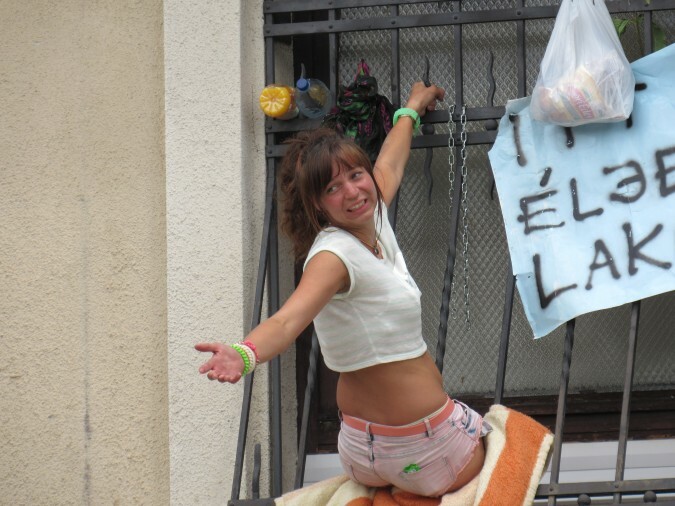 This is not an isolated situation–we have seen almost the exact same scene this past February, in front of the Electoral Commission’s headquarters. For those who lived through the seventies and eighties in the Eastern bloc, the news that police decided to take an activist in for a psychiatric evaluation will likely bring back some memories of how authorities then dealt with alternative cultural circles and others who protested the regime in their own way. The Orban regime serves another proof of it’s nature. The thugs are out again, but the mental ward tool is another first on the path from fascism light to a full fascist system. Add the total and institutionalized corruption which bleeds the economy, wears down the impoverished population and literally kills thousands in the the emaciated and deteriorating health system. Another demonstration of the heartless nature of the regime is today’s Népszbadság news of a leaked document which suggest to the cabinet higher prices for the so called „social care” services adding another 2.5 billion Ft to the already heavy health care burden on the population. The first report on the subject was in April this year when the government decided to take the chronically/longer term patients out of the healthcare system’s chronic wards (elfekvők ) and place them to the proposed special nursing homes. in The re-classification has a sinister tinge – from the formally egalitarian and free healthcare service these patients are moved into the even more emaciated and often paid social service, with much less commitments on part of the state. The shifting of the financial burden is further emphasized by legislation obliging relatives to care for such patients. The final touch in this move was to enable social service providers, state or private ones, to collect their services from such relatives. Seems the poor were to be damned again. Following an order from Orban as he wanted to meet him and discuss the issue in person. ” who managed to climb the roof of the museum, “—-“was forcibly taken by police, against his will, to the psychiatric ward”. Where should they take him from the roof? Church? Why aren’t you at work, you dirty Gypsy?”–yelled the heavily tattooed thug hired by Városliget Zrt.——–And what was the answer? You say to the psychiatric ward as a matter of course. But what about a small concentration camp? After some light beating up, of course. I’m sure there are more such ideas where this one came from, since you borrow freely from both fascism and communism. That’s a tiny little thing a few totally harmless demonstrators and the whole thing gets overstated, exaggerated and painted in a book of fairy tales. I look at France. Now that’s something, that’s revolution and look at the police, teargas, beating demonstrators committing really serious atrocities. Yes? Yes! Dead silence. There was a hysteria that Orban will use the migrant and terrorist threat to introduce the state of emergency and who did it? Hollande!!! Oh that’s different, that’s democracy in the democratic EU. Ridiculous. Moreover, as there are more demonstrations there, he is restricting public gatherings and demonstrations. Oh, democracy. Orban was accused of planning to take Hungary’s out from the EU and who did it? The U.K. was the first to leave. Orban was accused of persecuting the young intellects out from Hungary meanwhile, it just happens in the U.K. where more than two million of young talents left the country in the past few years. The Matolcsi and the whole Hungarian banking sector is under fire meanwhile it is the Deutschebank, the largest bank in Europe that manipulated gold prices, failed, and is bankrupt now and is under Chinese control. The whole EU is nothing more than a democratic dictatorship with totally corrupt gangster politicians let alone the banking power elite and they are pushing the U.K. after the referendum to leave as fast as they can in order to create a superstate where all countries will be ripped off their independence and will all rendered powerless under a rule of a new European superpower military force and law. So, I understand that Chris is only focusing on what is happening in Hungary, and I understand that he is absolutely right. But I might as well get some understanding too for not being completely blind, for looking around and seeing the EU and then reading these pieces the only words I can say : yes he is right and so what? Who’s gonna kill Hungary Orban or the EU gangsters. Who is the gangster here? Otherwise you may see yourself fighting fire breathing dragons or feel abducted by UFOs. I wonder how you managed to get a WIFI connection in the mental hospital where you are. When this recurrent pill mania is on you again, please don’t bother me with it, just push that little knob on the emergency switch in your cell, call your handler and he will give you all you need. The fire breathing dragons and UFO are something new I hope your mental condition is not worsening. Good luck boy, and when you feel better and the haze in your brain clears up you might as well be able to observe and understand what I said and tell whether I told a lie or not. Whether you told a lie? Boy you did, and much nonsense and propaganda lines , just like a troll. No point stirring such… hm… nonsense. the nonsense is how berserk, aggressive and senseless you and some other fanatic posters go here when someone dare express their opinion that is about something else than ceaselessly vilifying Orban. As if the whole world and all problems would only be Orban. Seeing this site of opposition and the purblind comments I have no illusion what kind of hell is coming if you guys manage to remove the present government. I myself not a big fan of Orban and was against him but not with you guys. You are worse than him. Let him stay and his government stay until you are there around. What’s interesting about the images is how (relatively) calm the police, thugs and even protestors look compared to similar photos in the US where you see people yelling and shouting, shaking fists, etc. and police with tear gas and riot gear. The man in the red shirt being carried away looks calm and even cooperative; the police standing around the woman on the ground don’t look particularly enraged or agitated. I am not condoning what happened, simply observing a veneer of civility in these photos. Dear Ilona, it is not what you can see in the photos that counts, it was what wasn’t caught on camera that became the problem. The police weren’t the problem, it was the private security that seemed to take over and do things “their way”. My understanding is that in Hungary, you mustn’t show the faces of serving police? A thoroughly non-democratic rule – which encourages unaccountable actions and thuggery. I was once in a British Car with my partner and we were stopped in very dark countryside. I believe they only stopped us because we were ‘foreign’. They blinded us with powerful car lights and we could only see silhouettes with their powerful ‘club’ torches. I believe they were going to find some pretext to ‘fine’ us – we couldn’t see any lapel numbers and were really scared. Because my partner stood up for herself – I couldn’t understand the dialogue – they let us go. There was absolutely no breach of anything, they didn’t even breathalise us. They just changed their mind. Had we been both foreigners I believe they would have screwed us for a wad of Euros. Having published their faces could you be arrested if you enter Hungary – and they know who you are? The single clearest differentiator between this scenario in Varosliget and scenarios in the US, France, the UK, etc. that are cited above – and the MAIN POINT OF THIS ARTICLE – is that there are tattooed, racist, non-uniformed, non-identifiable skinhead bulldogs in black leading the ‘enforcement’ action. This is a lot more like fascist Germany and Italy in the 30’s/40’s than it is like ANY EU COUNTRY or WESTERN DEMOCRACY in the 21st century.. no matter how calmly or violently the activities proceed. @Robert, @Richard, etc. THAT IS THE POINT OF THE ARTICLE. what’s your problem? Difficulties with speech comprehension? O.K. I help you, I repeat what I said for you and for people like you with weak mind. Now, calm down and read it a few dozens of time until even you can understand. Now, get it? O.K. Let’s take the next step. Can you still follow me? I tried to take the advantage of democracy and freedom of speech and expressed my opinion about the whole EU which we belong to and such as we need to look into it and evaluate Orban’s role impartially by seeing the whole picture. Now, that was the point when I was rejected at this site by posters who are the bullhorn of democracy. What kind of democracy is when you twisting other people’s comments. Why, if I may ask? Because there is only one thing that is accepted here, attacking Orban, or even worse, looking around, opening one’s eyes, understanding the word is unwanted? I’m afraid the latter is true. It looks like it’s very important for many of you that people remain blind, chew the rubber bone that was given to them and never look around and never try to understand what is going on on greater scale. My message to you: too late guys, the world is awakening. you know, I’m less interested in attacking O.V. than despairing over the complete inability of the Hungarians who have remained in Hungary (since almost everyone Hungarian I know (and I lived there for 5 years from 1990 – 1995) has emigrated to another country, finding Hungary intolerable and completely lacking in opportunity) and the opposition part(ies) to get their acts together and take some steps to vote out the current government and vote in a government that is not filled with kleptocratic mafiosi. That’s true and was many time discussed whether the Hungarians are genetically inferior or not. What I say and what I try to see and understand that considering Hungary’s geopolitical position not everything is their blame. I myself emigrated but wait, not all the talents emigrated, and among the emigrants there were many criminals mafiosi or simply underqualified people with poor human qualities, not only the cream of the society left the country. Meanwhile there are many thousand of genius, highly qualified people staying in Hungary and as you wrote they never stand a chance and are lost. That’s why I try to help Hungary and are asking for help instead of exaggerated criticism. Meanwhile, talents leaving their homeland is not specific to Hungary, see the U.K. or Germany or Japan. Tens of thousands of their highly qualified engineers and scientists leave their country only to get a working visa in China in two days and jobs with excellent salaries, making China the strongest military and technological power in the world. Let alone their influence in the world economy and finance. 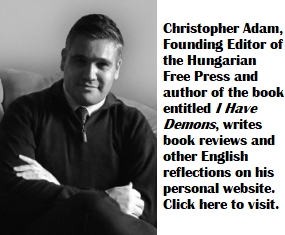 Now, how on earth could I or anyone else help Hungary without seeing the whole picture as one? The whole world is at war and in turmoil and in misery. Yes, the EU too, and all the pink image of the EU has been broken now after BREXIT. Or what, conjure a little heaven in Hungary when the whole EU is a trash heap? Who could do that? Fascism is awakening all in the EU, in Germany, in France. Let alone PEGIDA from Germany to Canada. Fascist never lost WWII. They are here, everywhere and those thugs in the Cit Park are just toys. Too bad I dare to see that, too? no question the rest of the world has its share of problems. Calling these out doesn’t make the situation in Hungary any less dire or concerning by contrast/comparison. Yes, it does as it serves better understanding of people’s life, helps finding their place in the world and in their country and making them think in the right way in order to find the right solution to problem solving as we are a part of the world, the EU, and the problems of the world, — strategically, economically, and politically — and not the opposite. We are not causing the migrant crisis, on the contrary it effects us, we did not bankrupt the EU on the contrary their bankrupt will bring us down, our PM is not the only criminal on the contrary the whole EU political elite are gangsters otherwise how could put up with Orban in a truly democratic and free union only for a few days without their silent approval? They could get rid of him in a day if they really wanted. But what does he do? democratic dictatorship with velvet fist, the same what the EU leaders do in the EU countries. People gotta see what is happening not only in their flat but in the whole apartment building if they wanna survive. Why feed the troll, a somewhat silly one too. You noxious idiot, fighting so hard to hide the real world from the eyes of the people. And you call others troll? Now, time to call your handler. Correctly: how could they put up with Orban in a truly democratic and free union even only for a few days without their silent approval? you asked for that calling me a troll. Do you want more? I can instill slowly all the news while you are waiting for lobotomy that would improve your mental capabilities. Ask for more? So, what did I do to deserve being called a troll. I said that Chris is right, this is unacceptable that the Orban government or anybody under their governing hires tugs to intimidate peaceful protesters and yes this is fascism. I was not a troll. Than I added, that it is unacceptable that ANY GOVERNMENT OR SECURITY FIRM can do that and the same thing is happening in the trash heap EU, which is just decomposing and flat bankrupt.